Arms' latest fighter is a spunky, balloon-pants wearing brawler. There's a new fighter coming to Arms, the Nintendo Switch's latest and greatest motion-based fighting game. 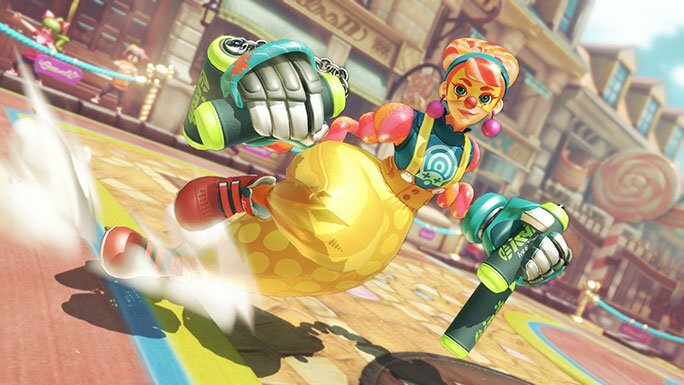 As revealed late last night by Nintendo, the balloon-bolstered brawler Lola Pop will soon be bringing her unique skill set and street-performing fighting style to Arms in a forthcoming free update that will be made available to all owners of the game. This announcement has coincided with the reveal of Nintendo's upcoming Arms Global Testpunch demonstration, which will allow players who haven't yet picked up the game to get a free but limited trial run through the title. Nintendo's next upcoming Global Testpunch will take place this weekend, from Friday, August 15 at 8 a.m. Pacific time to 1 p.m. Pacific time on Sunday, August 27. While there's no firm release date for when players can expect to start playing as Lola, the company did reveal some of what makes the character so unique. Using balloon pants that would make MC Hammer proud, Lola can inflate her form in order to provide a boost to her defense. Players can also expect Lola Pop to be released as part of a free update that includes three new arms and one new stage, meaning there shouldn't be any reason for Arms players to miss out on the fresh content. Players can check out Lola Pop's unique fighting style as well as some of the new arms that Nintendo is introducing in the forthcoming update within the all-new Lola Pop teaser trailer featured above. Get the most of Nintendo's new hybrid console by checking out some of the great titles we've featured on our list of the Best Nintendo Switch Games.